How you Hand can save you from taking Debt - Lines in your hand can Save you from Taking Debt. If you have following lines in your hand, you must careful while taking debt from anyone. Do read the cause and remedies to resolve it. Aaj ke astro uncle ke upay main hum janenge ki karz lete waqt kya kya dekhna chahiye, agar aap ke hath main bhi aisi lines ho to aap dekh sambhal kar karz le. There are some lines in the hands, in the following picture we have shown you, if any of the symbols are in your hand you should be careful while taking debt from others. 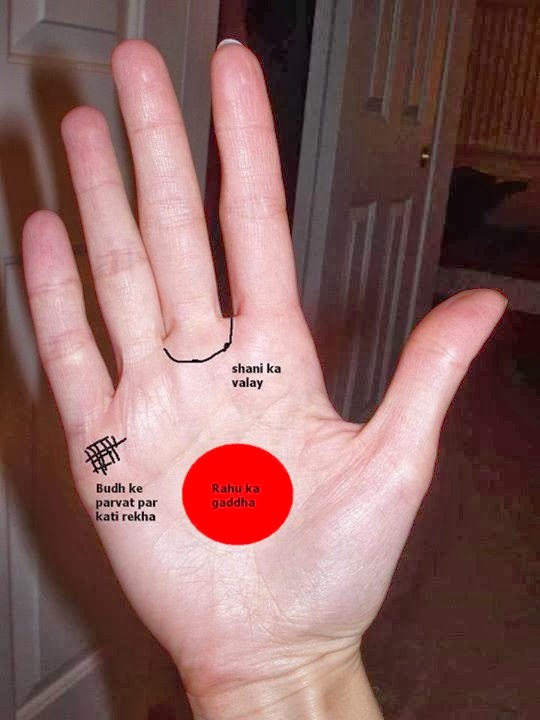 If there is dent made in your palm, it is also called as the dent of Rahu, debt cannot be yields to this type of people, however if the debt has been taken then make partners of its husband/wife, after making surety that even they do not have dent of Rahu in their hands. Those who are unmarried and they take debt, and they have dent of Rahu in their hands they can make partnership with their mother or father. Dent of Rahu creates obstacles to repayment of debt, therefore this type of people should abstain from the debt. If the Rahu’s line freezes in your own destiny then never take debt. They should neither take debt from others and nor give debt to others, because debt cannot be recovered after giving this type of persons. If short line comes together on Mercury's mountain then never take loan nor give to others. If the Saturn is in your hand then the transaction of debt should be done after thinking. If fate line climb above the Saturn finger then never take debt, do not take any kind of debt from anyone, if the debt is taken the life will full of issues, therefore keep this is mind. If your Jupiter is weak in your horoscope then never take debt alone, make partnership with mother, daughter, wife or the second numbers of children else you cannot repay the debt. If Rahu and Ketu are strong in your horoscope then also do not take debt, because you will cheat by others or you cheat others, you make excuse at the time of repay, may be going missing. If you give debt a person, then give that person’s whose Moon, Mercury and Jupiter are good because this person will return the debt definitely. And if you have given debt to that person’s whose Rahu and Ketu are strong they cannot return the debt easily, there must be conflict to get back the money also there is possibility that money cannot recovered. There is make one here, that strong Rahu and Ketu are not always good, you can check their robust in your hand on mountains of the hand. So, now you are all clear how the fortune lines your can save you from big debt problems. If you liked this article, do share it.Thank you!